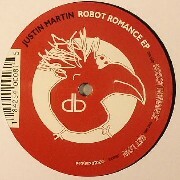 Justin Martin has always been a key member of dirtybird but believe it or not his last solo EP on the label was released in 2005! It is hard to believe such an influential artist on the label has taken so long to deliver his 2nd EP but the wait is over and it was worth it. The Robot Romance EP defies genres. It is house. It is electro. It is funk. It also draws heavily from Drum n Bass, hip-hop, and even Kraftwerk. Most importantly, Justin has delivered his own sound which is the true marker of an original artist. This EP is the lead off to the dirtybird 5 year birthday project which will be released in April, 2010. The 3 CD compilation will also feature classic dirtybird tracks and a special label mix CD by Justin.